The graphics state maintains a list of attributes related to shading. Associated with the shading state are a current color and a current opacity. All geometric primitives use the current surface shader for computing the color (shading) of their surfaces and the current atmosphere shader for computing the attenuation of light towards the viewer. The graphics state also contains a current list of light sources that are used to illuminate the geometric primitive. Finally, there is a current area light source. Geometric primitives can be added to a list of primitives defining this light source. shadername is the name of a light source shader. This procedure creates a non-area light, turns it on, and adds it to the current light source list. An RtLightHandle value is returned that can be used to turn the light off or on again. The light is also turned on and added to the current light source list. An RtLightHandle value is returned which can be used to turn the light off or on again. This is a control that increases the sizes of calculated bounding boxes on primitives in order to account for the effects of displacement mapping. The size is specified by identifying a single floating-point value which is the radius of a sphere which is guaranteed to contain the maximum possible displacement, and the name of the coordinate system in which this sphere resides. This value should be as tight as possible. It is extremely inefficient, both in terms of memory usage and calculation time, to specify a bounding sphere which is larger than the actual displacement. Therefore, this sphere should be as small as possible without permitting points on the object to displace farther than the sphere's radius. In RIS, ShadingRate controls the tessellation rate, not the shading frequency. The shading frequency is controlled by the path tracer's "maxsamples" settings. ShadingRate should be set to a numerically high value on area lights (e.g. 100) unless your area lights have high curvature or high frequencies in the emission. Set the current shading rate to tessellation size. Attribute "shade" "relativepixelvariance" sets the value of the relative pixel variance equal to the relativepixelvariance value multiplied by any other pixelvariance value. This allows users to change the rendered quality relative to the main pixel variance quality threshold. Keep in mind that extreme values may create artifacts or "halos" around objects where their pixel variance thresholds are very different. This option is also only effective for objects seen by camera rays and not (indirectly) reflected or refracted in other objects. 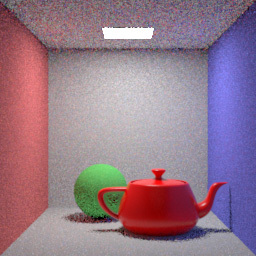 "Relative Pixel Variance applied to red teapot"
PxrPathTracer supports group subsets and flags for shadowsubset, reflectsubset, and transmitsubset. When a set is applied to geometry, it participates in the specified lightpath. For example: Objects that are part of a shadowsubset will cast shadows on objects using the shadowsubset trace setting. Other objects without this membership are excluded. "Frame" frequency can lead to more efficient rendering due to reduced shading and reduced memory overhead, but may be inappropriate for situations where primitive variables are themselves motion blurred, or shading scenarios which demand a higher frequency of shading for accuracy. Also, in some cases of extreme motion blur, objects with "frame" frequency may be less efficient to bound, leading to higher hiding costs. If the Detail capability is not supported by a particular implementation, all object representations which include RI_INFINITY in their detail ranges are rendered. If sides is 2, subsequent surfaces are considered two-sided and both the inside and the outside of the surface will be visible. If sides is 1, subsequent surfaces are considered one-sided and only the outside of the surface will be visible. controls grouping of objects for LPE outputs. This is useful when a specific set of objects and/or their contribution is needed in an ouput AOV. would capture illumination from the identified "crate" group into an LPE output. sets all the indirect transport modes at once. Note that this is the preferred visibility state when using PRMan's RIS mode, as there can be both diffuse and specular contributions via the indirect (even if diffuse was sampled, there may be some specular contribution). It is on, , by default in RIS mode only. controls the visibility of primitives to transmission (shadow) rays. The "clamped" off-screen strategy has been used in all previous releases of PRMan: objects outside the viewing frustum are never split and their dicing rates are clamped to sqrt(maxgridsize)-1. This can give very coarse off-screen tessellation and shading which can sometimes be visible in reflections and refractions. The watertight tessellation primarily aims to eliminate a major source of pinhole artifacts in objects by eliminating T-junctions that arise due to the use of regular rectangular dicing on adjacent faces. This attribute is added in PRMan 20.12 onward. This is a flag that indicates whether the lowest level patches must be diced into a grid of micropolygons with power-of-two dimensions. This attribute is typically used to prevent patch cracking on high-curvature patches. This attribute is deprecated in PRMan 20.2 onward. This Attribute, specifically used for RiCurves geometry, makes thin hair-like curves much cheaper to shade, and more memory efficient when dealing with long hair which spans multiple buckets. When it is enabled by setting to 1 (it is disabled by default), Du() of any quantity is 0, with the trivial exception of Du(u) = 1. In other words, derivatives across the width of the curve are ill-defined. Because of this, this attribute should only be used for curves which are truly hair-like (very thin in screen space). enables "pre-tessellating" subdivision surfaces into polygons on the fly (in RIS mode only) for improved memory performance. This can also be set via rendermn.ini with /prman/dice/pretessellate 1 or via a corresponding Option. It is on - 1 - by default. Be aware that the saved attribute state includes the current transform state. Since the entirety of the saved attribute state overrides the graphics state for the procedural primitive, this means that the saved transform state will be the one applied to the procedural's bounding box (but not its contents). If the saved transform state is different from the current transform state, this will require transformation of the bounding box from the current transform state to the saved transform state. For example, suppose that we have the following procedural which has been modified by a translation.